COME AND ENJOY BEAUTIFUL VIEW SURROUNDED OYA RIVER WITH KANO. 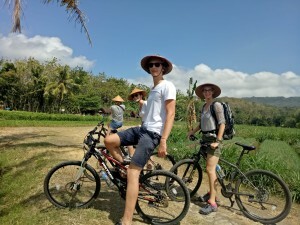 Explore and sense diferrent vibes of Yogyakarta and indulge yourself in a slower paced of life style by visiting old cultural villages with rice paddy field terraces stunning views and the great Watu Gede volcano as its amazing background. Pedalling your way through the greeneries surrounding this tranquil beautiful village. 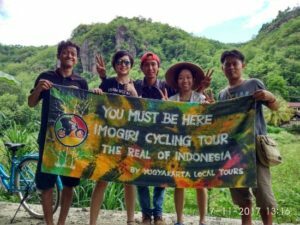 This tour is focusing on daily life of Imogiri villagers. You’ll be welcomed by warm smiles and friendly faces of those villagers. You’ll be rubbing elbow with javanese cultures, learning how to make batik (javanese traditional gorgeous pattern cloth) from the batik maker expert itself and bring back home your hand made batik scarf or painting as your unique souvenir. Take a dip of delicious traditional local snacks and cuisines, and play your rhytm with javanese gamelan musical instruments. 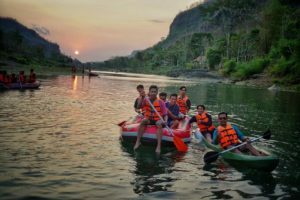 Refresh your soul in the stream of Oya river and Get your upbeat heart fit. Join us for this unforgettable experience. If you can ride a bike and enjoy gentle exercise, these are ideal introduction to a cycling for you. No routes are entirely flat, so expect some short climbs and descent. Cycling distance is ± 15 kms. 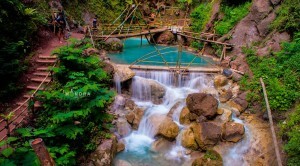 If anyone interesting to visit this waterfall, don’t hesitate to contact us. 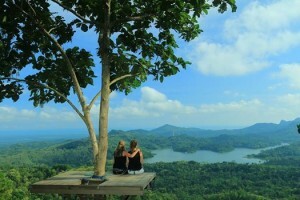 WHY BACKPACKER SHOULD VISIT THIS PLACE? Kalibiru become popular in social media since 2 years ago. It become busy and crowded in weekend or holiday. So many young local people visiting this place and the number increasing every year. 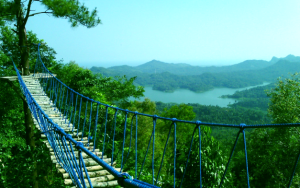 You visiting exotic place with nice view, beautiful green forest and reservoir water color. A nice sunset also provide in this place. If you like outdoor exercise, you might love this place. 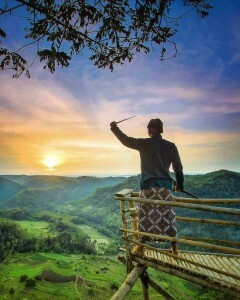 You will doing rappelling, flying fox and climbing to get the best view. Yoa can try adrenaline bridge, it made from rope and woods. You should trying GONDOLA at TIMANG ISLAND. This “crazy & dangerous” Gondola is very traditional (Old school). Trying Gondola at Timang island can lift up your adrenaline and be best experience in whole your life. You visiting exotic place with nice view. Quiet and peaceful. You also can hear the sound of the wave, birds and the sound of blowing wind. 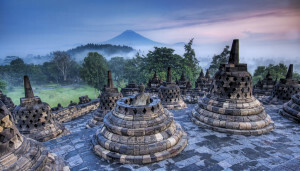 Witness the stunning sunrise over Borobudur, the largest Buddhist monument in the world. Constructed in the 8th and 9th centuries and abandoned around the 14th century, Borobudur was largely forgotten until it was rediscovered in 1814. The UNESCO-protected Borobudur Temple Compound is situated in central Java, an approximate 45-minute drive from Yogyakarta. 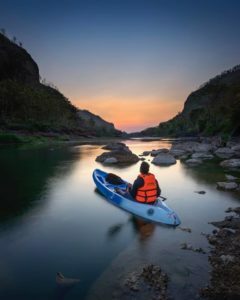 Get an early start and beat the crowds with a pre-dawn departure on this 6-hour private tour with your own personal guide. The Borobudur temple compounds, as they are officially known, were built in three tiers: a large base nearly 400 feet on each side that has five levels; on top of that are three circular platforms covered in 72 bell-shaped stupas, each with a statue of Buddha inside; at the top there is an enormous stupa that is more than 100 feet in the air. The monument is covered in carvings, with 2,600 relief panels and more than 500 statues of Buddha. The UNESCO protected Buddhist monument was abandoned in the 14th century after the bulk of the Javanese population got a taste of Islam. In the 1970’s, a restoration commenced, and now the once ignored Borobudur is Indonesia’s most visited tourist attraction. 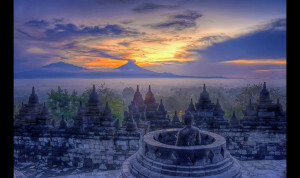 The sunrise over Borobudur is without doubt one of the travel world’s most spectacular and unique experiences. But, how do you get prime-time sunrise viewing, without being surrounded by swarms of other tourists? Borobudur is about 45 minutes from the much larger city of Yogyakarta, a city of half a million people that most visitors to Borobudur use as a base. If you want a jump on the hordes, there is an easy way you can get access to Borobudur, an hour and a half before everyone else. You can be at the top of the temple, taking those Borobudur sunrise money-shots when everyone else is still lining up at the gates, waiting to get in. A Borobudur sunrise is an absolute must-do travel experience. It is a very good reason why it is the number one attraction in Indonesia. You will never forget this experience.